I have been taking some flack in text messages and comments on DNF for not immediately going to the doctor when my foot started to really hurt. Here, in long, is why. First of all, the three responses to injuries, in my opinion. Address and deal with it in a manner that allows continuous progress. Give in to the injury and let it over take you. In the course of this I will get around to giving examples of all of those and explaining them in greater detail. Here goes the history of injuries that I can remember seeing doctors for related to my physical activity. First we start with middle school. I went to the doctor before that and have for physicals many times since, which turned out well, but we are focusing on unplanned trips to see a medical professional. Once during the summer while I was in middle school I was swinging on a swing and jumping out just when it reached the top. Something that just about every little boy figures out at some point. It’s way more fun than just swinging back and forth. Anyway I was doing that and once my arm got twisted around the chain on the swing as I jumped. The chain and I yanked on each other and I fell to the ground with a very very sore arm. I had never had a pain quite like that and I wasn’t sure what was going on. So my mom set up an appointment with the doctor for later that day. Fast forward a few hours of nervous sedentary anticipation and after looking and taking an x-ray the doctor determined that it wasn’t broken but just severely bruised. In other words, it was going to hurt for a few days and there was more or less nothing that they could do for it. That is a score for the doctor because he was spot on, but I wasted a precious summer afternoon sitting around and ended up in just as much pain as before the doctor’s visit. Second we go to early high school, maybe even 8th grade. I was growing I suppose. My legs were hurting just below the knees and I was diagnosed with Osgood-Schlatter's which is basically growing pains. Again the doctor was spot on, but there was nothing he could do and the pain came and went now and then over the next few years. I still get it occasionally. I had it for a couple of days a few months ago for the first time in maybe two years. Nothing that slows me down anymore, certainly something I ignore now and did ignore most of the time. Third we have mid-high school maybe the fall of 2002. I am the first one to be a runner in all of my extended family so no one really knew what to expect. So no one know what it meant when I had trouble breathing while I ran. Again I went to the doctor and told him about it. The diagnosis was exercise-induced asthma. He wrote me a prescription for an Albuterol inhaler, that I used with the aereator as directed, three puffs before I ran. I did that right on schedule for a week, and it didn’t make a difference. No one told me, and no one has, I figured this out on my own, there is a break in period to running. For most people 1000-3000 miles or 100-500 hours of running are needed before you “figure out” how to breathe. So I quit asthma after a week. Maybe I actually have it, maybe I don’t, the point is I don’t care because I’m not letting it slow me down. Fourth, athlete’s foot. This had to be one of the best medical experiences I have ever had. It was the summer of 2005 at Philmont and I wore boots from about 6:30 AM to 9:30 PM every day for six weeks. That’s a recipe for athletes foot. I ended up getting athletes foot all around my foot, sides heel, top and everything with small “blisters”. The “doctor” was actually a medical student there for the summer who had to go and get a book and look up what I had. He called it moccasin style athletes foot. He gave me some athletes foot stuff, prescription strength as I remember, and told me to air out my feet when possible during the day and take a shower more often. Both of which I did and it cleared up. That was an example of dealing with it but not letting it slow me down. Fifth, we have runner’s knee which was as bad of an injury as I ever had. It was the winter of 05-06. I had just come off my best cross country season and running my first sub 5 minute mile. I was starting to understand that you need to train year round to be good at anything. So I was running in the winter in Wisconsin. Unfortunately, I went to buy running shoes, and the pair that I bought was a women specific shoe with lots of cushioning, whereas I was more of a stability buy back then. I feel that the shoes allowed my knees to bend in and the repetitive mmotion led to runner’s knee. What did the doctor say? “Don’t run for six to eight weeks.” I went back to college having not run since it flared up about two weeks before. I was cross training and spening time in the gym while everyone else ran. I talked to my coach about it and he took me in the weight room and showed me how to so squats and explained that it was due to a muscle imbalance in my quads. Doing squats would correct that. He was right!! This was the fastest recovery from an injury I have ever had. I went from running two and three days a week to running five and six days a week inside of a month. That was near the beginning of my 15 consecutive personal records. 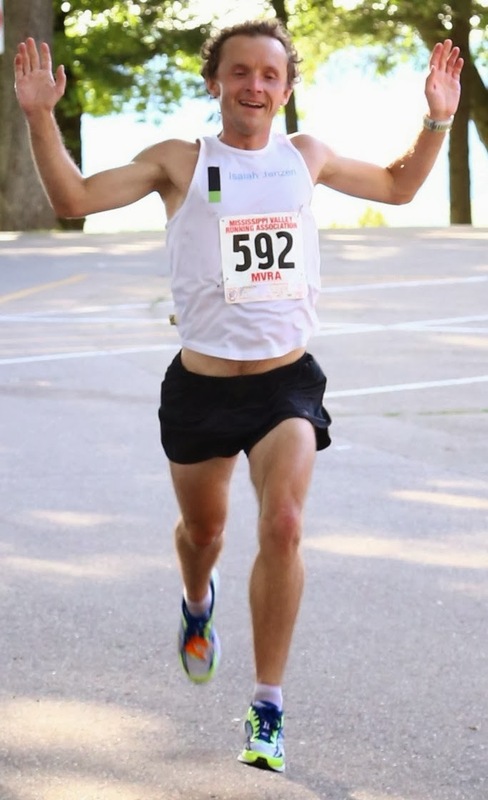 I remember running a 4:52 mile, nearly an 8 second PR off of three days a week of running, but lots of lifting. That injury started off as a let it consume me and progressed to a deal with it. Now I know that if I skip lifting or hip exercises for two weeks I will be injured guaranteed. To be honest, I think that the lack of respect for my lateral strength and total flexibility is what put me in the hole I am in now. Next my sesamoid bone breaks, this is a good story. It started on the MIT indoor track running a 5k in February 2007. I was wearing some ridiculous 6.5 size Nike Ventulus shoes and running around the indoor track it just hammers your feet when you normally train in supportive shoes. Anyway, my sesamoid bones hurt quite a bit after that but I didn’t know what it was so I took some time off, I think it was 3-4 weeks then trained for a half marathon (and ran under 1:20 for the first time) while I was in Costa Rica on IQP. When I started my summer training for cross country I was doing strides barefoot on the grass in Institute Park and after a few the balls of my feet started hurting dramatically. This was a great doctor’s visit. I called and set up an appointment with a podiatrist. I figured my foot was hurt so I should go to someone who knows. Well, you aren’t “supposed” to do that. Insurance companies like it when you see a general practioner first and then see a specialist. I didn’t know any of that until later when they were trying to sort out the billing. Why must I waste a doctor's time to see a specialist when I know that the specialist will help me faster? At the doctor's office I describe my symptoms, they take some x-rays, which I think I have somewhere, and tell me I have broken sesmoid bones, but it is not uncommon. They were willing (is that the right word?) to sell me orthotics and recommend that I stop running for six to eight weeks. This was the first time I blatantly told the doctor that I wasn’t going to quit running for six weeks. I also didn’t want the orthotics so they cut some foam out with the adhesive on the backside and put it on the insoles of my shoes. I ran with some form of L shaped cutout in my shoes for nearly every step of the next 3000 miles over the next year. Including new spikes that fit my feet better and had a firmer sole. The next summer I shunned the L pad and had a great summer of running. As far as I know I still have broken sesamoid bones. Next we have Plantar Fasciitis. This was the worst injury I have ever had bar none. I was having tight calves and tight arches for a few weeks at the end of summer and on the second workout of the year that I intended to get to nationals and run really fast times all of the sudden I felt the bottom of my foot tear. It was on the third interval on the hills by the tennis courts behind that local high school to WPI, Doherty maybe? I ran the fourth interval and then called it a day. I was in severe pain. That was it. I tried to run for a couple more weeks out of desperation because I could run it just hurt, and it hurt the farther and faster that I ran. The last race for me was All New Englands where I went out consistently in 5:20 miles and fell apart after two miles. That was my last season of elegibility. I thougt going into that season that I had a shot at going to nationals and certainly being all new England. It was not to be. Same advice from the doctor, don’t run, get orthotics. I spent the fall bicycling and lifting weights. It was the first time I really came to appreciate the fall in New England. It is beautiful! I mean there are so many back roads that are wooded and so many hills and little old towns. It’s a great place to bicycle. This was an injury I gave in to. I just accepted that I could not run. For 11 weeks and one day I did not run a step, and you know what? It wasn’t really any better when I started running again. However, I learned a number of exercises from the internet and was progressing to more motion control shoes and these things managed to hold off the pain. I was able to run just under 34 minutes in the 10k quite easily and qualify for D3 New Englands, which was a modest vindication to myself that I was a little more consistent than a single 32:58 I had run the year before. In short, not running does not cure plantar fasciitis. Barefoot walking and running as well as exercises like pianos and toe curls do cure the dreaded PF. Motion control shoes can help postpone the intense pain from PF, but eventually you run out of more motion control and need a stronger foot and ankle. Next is my psychosomatic incident. It’s not related to running except to say that for the most part it felt the best when I was running. The point is I went to two doctors, they both thought I had kidney stones even though neither one had any proof except that I was complaining of lower back pain. The thing is neither doctor asked if I was stressed out or any psychological questions. Had they asked they would probably easily realize that I was the most stressed out I had ever been. I feel we try to separate the physical and mental, but we must remember that the brain is physical and can do big things too. The fact that two general practice doctors could not figure out what was wrong with me when I now realize the problem was simply stress. How many other stress related problems are misdiagnosed every year? Next is my stress reaction, that was a pretty clear cut event. They took an x-ray, it showed up clearly and the advice was not to stress it out much. He didn’t tell me not to run so I just ran less. Like 10-20 miles a week for two months. It’s a level of running that while not great for training goes a long way toward mental health and even physical fitness. The hard part about this was that I left my job for half a day and I went outside of the chain of command to get it done, and that isn't the most respected way to get things done. This most recent event the doctor walks in with the results of the most recent physical I had, which he never reviewed with and says, “you don’t need a physical.” I realize that people are thinking I’m an idiot for not taking the crutches and 800mg ibuprofen three times a day and wood shoe. But how many times in the past have I been told not to do something, and that only cured the symptoms not the cause. There have been times in the past when medical attention was not afford to me easily. I was without insurance at times in 2009, 2010 and 2011 all for different lengths of time. When I was up on Broad peak, no one was going to carry me to the ambulance. Helicopters don’t fly at 23,000 feet. I foresee a time in my future when I will be in a similar situation and have to deal with a number of possible traumatic injuries. I feel we have become weak as a culture. If you are hurt, just go to the hospital. Well, that is not always an accessible option. I really feel that there will come an event or multiple events in my future where I am the human to get things done. How do I train for that possibility? Do I flinch at every ache and pain? No, that is not an option! Besides with questions like retirement and the stability of the global economy in question can you really assume that your every ache will be taken care of? A famous dead runner once said, “I don’t run races to see who is the fastest, I run to see who has the most guts.” Extrapolitating that microcosm to the rest of life it gives life a different perspective. Put another way, what is possible? Can I ramp up my mileage, get hurt and recover? All without a team of doctors and support personnel? I would love to have that team, but no one cares about my physical wellbeing. Healthcare professionals want their money, and I can’t blame them. Next we have grad school. I sat through a couple of PhD presentations, all about as long as my master’s thesis defense. It was interesting to see that four or five or six years of study led to a presentation less than an hour. After seeing all that they did I learned that they are human too. Their subject matter may have been complicated, but it was certainly not incomprehensible. Additionally, I stumped professors a number of times in grad school, before the teacher always had the answer, but now I knew that there were so many holes in what we know. Plus! I was learning about heat treating steel, something we have been doing for hundreds of years and doing well and effectively. The human body? Forget it! There is so much going on and so many possible loading cases both mechanical, chemical and biological that trying to understand even a simple foot seems ridiculous! In other words, I have an idea of what it takes to become a doctor, and while it is very strenuous, it is certainly not impossible and does not make a doctor more informed about your body than you are. Finally, what about patient care? How often does a doctor look someone in the eye? How often does the doctor ask, "how are you feeling?" It seems like we are trying to treat progressively smaller problems and forgetting about the bigger picture. In other words, the classic advice, 'when you get hurt from running too much, stop running until it doesn't hurt to run again,' does not really cure whatever caused the injury, unless you believe that running causes injuries. I submit that running incorrectly, which just about everyone does, leads to injuries, not the excessive volume of running. What more is there to say? I feel our medical system is built about what you can see, broken and bleeding things, rather than overuse injuries and mental or emotional influences with their tiny abnormalities just do not fit the A+B=C model. I really enjoyed the comments on DNF, keep them coming. Your past experiences with the medical profession does not allow stupidity on your part when making decisions about your current health. Much better to be safe than sorry.